We want to increase the recycle flow from our sulfuric acid alkylation wash tank. The mixture going through the recycle is mostly alkylate (butanes, iso-butanes and propanes) along with 98% sulfuric acid. We're having trouble linking the percent open of the control valve with the actual flow measured across an orifice plate (Figure 1). Why are we having problems? Do we need a larger valve? As your flow changes, the upstream and downstream pressure available for the valve to operate will change as well. This will impact the flow calculated by using valve position. If you are using constant upstream and assumed downstream pressures to get flow from the valve position, it may not be very accurate. Besides pressure, phase is also important. Make sure that your fluid doesn't change phase upstream of the control valve or the flow meter. This will make measurements inaccurate. Make sure that both the flow meter and valve are sized for the same type of fluid, generally 100% liquid or 100% vapor. Make sure all the stream properties for specifying the orifice plate and valve are consistent. Check the flow transmitter calibration as well. Temperatures, pressures, density differences, etc. will impact flow comparisons between the flow meter and the valve position calculation. And, finally, verify valve position on your distributed control system with its position in the field to be sure that the positioner does not need recalibration or replacement. Once you have validated and, if needed, corrected any of these items, go back to see if the orifice measurement and valve position calculation matches more closely than before. If not, you may need to determine if your flow regime supports using an orifice plate for flow measurement. Verify if you are in the laminar or turbulent flow regime. You may need to select a different flow measuring device depending whether you are in the laminar or turbulent flow regime. Based on the curve, the valve position is fairly high if the flow is increased more than about 25%. Because the valve flow coefficient, Cv, goes up dramatically as a centrifugal pump requires more head to overcome the pipe flow resistance, the percentage open also increases in a similar dramatic fashion (Cv = Q×(SG/DP)0.5) [Q being flow rate; SG specific gravity; and P pressure]. Most control valves are equal percentage and therefore shouldn't operate in their normal range above 70%. You could experiment with a linear valve or one with a characteristic curve that's in between. Determining the current valve performance is difficult. There's no way to match the actual flow to the valve position on a timeline. They're separated in space and valves are far too complicated. Tuning, though often a problem, and an easy solution, probably isn't the problem here. The control valve is a complex machine consisting of more than a plug and a port; there's the actuator with its spring, solenoids, seals, etc., and the linkage in between the valve stem and the actuator. 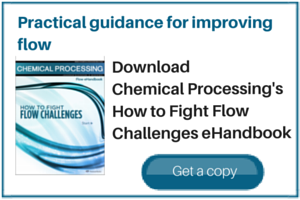 You might try averaging the flow meter output and the control valve position to steady the trends. While this may help, there is a problem: the valve and flow meter will have built-in control filters that will never cooperate effectively. Given the service, a sticky residue could build up on the plug, causing stiction between the plug and seat. A review of the maintenance files can verify this. There also could be problems with the valve stem seals. The spring could be corroded by exposure to acid. All of these resistances could cause the valve to move in a stepwise fashion rather than a smooth glide. The resistance, working together with the control signal, can conspire to create hysteresis, an oscillation that results in added response deadtime. If averaging the percent open, choose a midpoint on a hypotenuse of the backside of the step. Statistical analysis may help. The idea would be to group together the valve response points with corresponding flow rates. Then, with statistically relevant sets, say, about 20 points minimum, it might be possible to estimate the percent open matching the flow. An analysis of this sort is useless if the valve and the flow meter are significantly far apart geographically. With that said, this will allow you to generate a flow versus Cv curve for the valve. The next step will be to use this information in a hydraulic simulation to estimate the valve position with higher flow. The solution probably involves an iteration to adjust for changes in physical properties through the valve but the answer should tell you if you're below a reasonable position for the valve, say, 80% for a typical globe valve. Of course, this approach assumes the pumps providing pressure to the tank are sufficient — that's a different question. To illustrate how to use the valve position to control the flow process value, we will use the following nomenclature: FC.PV for flow process value (PV); FC.OP for flow control output (%); FC.VP for flow control valve position (%); and FC.SP for flow process value set point. The valve output flattening with time suggests that the FC.PV is overshooting the missing FC.SP. With the valve position behaving the way it is, the FC.PV will be difficult to control its set point with FC.OP as the manipulated variable. The underlying issue here is control of the flow process value FC.PV with the valve output FC.OP given the variability in the valve position FC.VP for changing value of the valve output FC.OP. This can arise depending on the internal valve mechanism of actuation. Most certainly, this flow control valve doesn't have a valve positioner but needs one. A soft valve position controller solution is outlined without the expense of a hardware-based valve position controller. It is a simple model-based control solution involving the causal relationship chain: FC.OP => FC.VP => FC.PV. It's clear from the causal chain that to control FC.PV it is pivotal to control FC.VP. Only in a well-behaving FC.VP, would controlling FC.PV with FC.OP work reliably. A soft valve position controller requires several models. These can be identified in real time with the controller in closed loop or in manual. The soft controller can compensate for valve stiction as well. Both FC.VP and FC.PV regulation can operate simultaneously albeit with different cycle times if necessary. (The valve position control loop is faster than the flow process value control loop. A fuller description of the details relating to the basis of the soft valve position controller can be found at www.unified-control.com/VirtualSoftValvePositioner.html). The soft valve position controller provides an alternative to a hardware-based solution and one that would work with any valve in a number of ways with little expense and maintenance. Unified Control Technology Corp., Princeton, N.J. Send us your comments, suggestions or solutions for this question by September 10, 2012. We'll include as many of them as possible in the October 2012 issue and all on ChemicalProcessing.com. Send visuals — a sketch is fine. E-mail us at ProcessPuzzler@putman.net or mail to Process Puzzler, Chemical Processing, 555 W. Pierce Road, Suite 301, Itasca, IL 60143. Fax: (630) 467-1120. Please include your name, title, location and company affiliation in the response.